NEW YORK -- Federal prosecutors say a Colombian veterinarian surgically implanted packets of liquid heroin into puppies' abdomens before sending the dogs to the United States. Andres Lopez Elores, 38, was initially indicted in November 2005 for his alleged role in a heroin trafficking operation, but the suspect has been on the run since, according to prosecutors. He was eventually captured in Spain and extradited to the United States on April 30. Prosecutors said Elores sewed packets of liquid heroin into the bellies of puppies in Colombia, and when the dogs arrived in the U.S. the drugs were surgically removed. Six pure-bred puppies were found with a total of three kilograms of liquid heroin packets inside them, a spokesman for the DEA told CBS News in 2005. 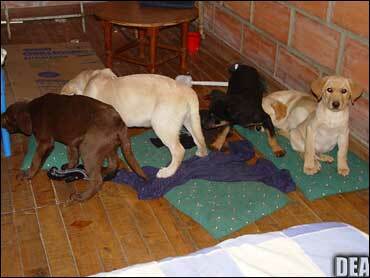 At least three dogs died as a result of the smuggling operation, the DEA said at the time. Elores was one of 10 defendants charged in 2005 with using a variety methods to smuggle heroin into the United States. He was arrested in 2015 in Spain's northwestern town of Santa Comba where he had been hiding after the country's National Court authorized his extradition. Officials said he had lived in the country for eight years before his arrest. "Elores is not only a drug trafficker, he also betrayed a veterinarian's pledge to prevent animal suffering when he used his surgical skills in a cruel scheme to smuggle heroin in the abdomens of puppies," said United States Attorney Donoghue Tuesday in a press release. If convicted, Elores could face between 10 years and life in federal prison.